And you thought your custom console plates were classy. How do you send an invitation with style? Email's out of the question, and a card simply won't do. Well, if you're Sony, you send a gift that's not only classy and stylish, but also plays Final Fantasy VII. 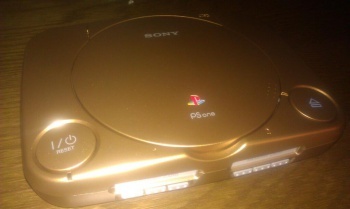 That's exactly what Minecraft creator Notch recently found in his mail - a golden PlayStation One, paired with a VIP invitation to Sony's PlayStation 4 press event at this year's E3. At the moment, console gamers can only enjoy Minecraft on the Xbox 360. Despite this, Notch and Microsoft aren't exactly best buds: the indie developer has openly criticized the direction of Windows 8 and Mojang has expressed interest in porting Minecraft over to the PlayStation when their exclusivity deal with Xbox expires. Notch also remarked that the Xbox One is shaping up to be a disappointment, commenting that he "wanted a game console, not a voice and gesture based TV remote box." It seems Sony has been listening, and in keeping with the company's recent efforts to win over indies, they'd like to extend a welcoming hand to Mojang. Ever the thoughtful gift giver, Sony evidently packaged an old copy of Dungeon Master 2 with the golden game system. Granted, the company overlooked the fact that the gift did not include PlayStation One video or power cables, but it's the thought that counts, right?